Welcome to the second installment of my "Off the Bench" series. 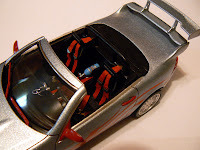 This time, the model that I am going to talk about is the 1/24th scale Mercedes SLK made by the Japanese company, Tamiya. Last year, when the price of gas got so bad, I started looking for something different to drive as my Suburban, gets something around 12 miles per gallon. I looked at all the typical choices, but decided that if I was going to buy another car, at least I was going to buy something that was fun, while still economical. I eventually narrowed my choices down to two, the Mercedes SLK 230 with a 2.3 liter, four cylinder engine, 5 speed transmission, hardtop convertible, and the Mazda MX 5 Miata with a 1.8 liter, four cylinder engine, 5 speed transmission and a soft top convertible top. Both of these cars looked fun to drive ( I have driven a Miata before, and can tell you that it IS fun to drive), while still getting over 30 miles per gallon. I found multiple examples of both in the under $15K range that I set for myself. I ultimately abandoned getting another vehicle as I was never able to convince my wife that it was economically feasible, so I just suffered through $160+ fill-ups on the 'Burb once or twice a week. And then the price of gas came back down and totally ruined any chance I had to convince her :) During my search, I also bought a model of each car (Man, I love eBay :)) and what started out as a "stock" build ended up becoming something much different. I used the term "Euro-Tuner" when I described it at the March meeting of my model car club. Tuner is the name given to the modified import cars (usually Japanese) that are so popular with kids today. Once I decided that I was going for the "tuner" look, I knew that I would need to make several modifications to the kit to achieve the look that I was after. The real car has a plastic cladding (covering) down each side that covers the bottom 3 or 4 inches of the door and the rocker panels below. It also goes around the front and rear on the lower portions of the bumper coverings. This cladding is to protect the car from damage from rocks and road hazards. However, I didn't like the look of it on the model (or the real car, for that matter) as it just looks like semi-gloss black plastic pieces added to the car (which is basically what it is...), so I spent quite a bit of time sanding it all off, smoothing the body, re-scribing the door lines and getting rid of mold seams. The next thing that I did was to add the front air dam and the lower wing on the rear. Since I was after a sleek look, both of these modifications were filled with putty and sanded smooth before painting. Once done, they looked like they were part of the car. 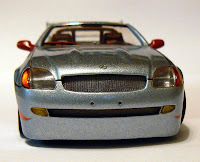 Once all the body work was done to my satisfaction, I primed the body, and then painted it with Dupli-Color brand paint. They have a series called "Metal Specks" that has larger metalflake pieces in it than their regular metalflake paint. One of the most popular colors that the real car comes in is silver, so I decided to step it up and used the Metal Specks silver. The same kit that had the air dam and a few other parts that I used, also had some cool red body side decals. They were too long for this kit, but I cut them down and put them on each side of the body after modification (I think they turned out pretty nice). I followed this with 5 coats of clear to "bury" the flake and cover the decals so that it could be polished smooth. I then set it aside to let it gas out for several weeks before polishing. I turned my attention next to building the chassis. Well, actually, the chassis was easy as I built it entirely stock,except for two small changes. Once the chassis was done and set aside, that left only the interior to do. Since this is a convertible, the interior becomes much more important to do neatly as it is more visible than it would be if one was looking in through small scale window openings. I was looking for something else one day at the hobby shop I go to and found an aftermarket tuner k it from Aoshima that had a whole bunch of neat stuff in it. The thing that sold me the most was that it had some VERY nice scale Recaro seats. It also had the top wing, extra gauges, two NOS bottles, two steering wheels and a few other little odds and ends. After finding that kit, I decided that I would give the Mercedes a race car-inspired interior. I started with the seats and added racing harnesses. The straps are made from 8 millimeter (6 or 7 mm would simulate a normal seat belt, racing belts are wider) strips of the same surgical tape that I made the window net for the Mustang from. The buckles and assorted parts are actually photo-etched aluminum pieces from Arrowhead Aluminum Accessories (AAA). I bent them as needed to replicate real hardware and installed them on the tape belts, after I had painted them flat red. The blue bottle between the seats is a NOS bottle. NOS stands for Nitrous Oxide Systems, a company that markets these systems for cars. In a real car, nitrous oxide (laughing gas) is injected into the engine just after the carburetor or fuel injectors and gives a serious horsepower boost. It can be tempermental at times, although when it is tempermental it is usually obvious by all the pieces and parts falling out the bottom of the engine :) It is possible to get systems that provide upwards of 250 horsepower at the touch of a button. These systems are very popular with drag racers and street racers, including tuners. Typically, this system would be in the trunk or backseat, but I put it where it is to add a little more detail to help tell the story of this model. Early on, I named the car "Bottle Baby" so it became important to have the bottle in plain sight to help with figuring out why it was named that. And just a quick FYI, the model is not quite done yet as I am going to make custom license plate decals for it (BOTL BABY) as well. I carried the racing theme to the dash as well. 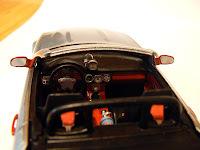 I added several extra gauges and switches to give it that racy look. If you look close, you will see two small red bumps on the steering wheel. Those simulate the switches that on e would press to fire off the solenoids in the nitrous oxide system. It is very important to have the car under control when you add an instant horsepower boost, so many folks put the NOS switches right on the steering wheel so they can have both hands on the wheel when the system is activated. I also made a roll bar across the entire car instead of the little roll-over hoops that the real car has. That added to the race look, but it also gave me a place that I could attach the shoulder harnesses to :) Final assembly was simply a matter of gluing the major assemblies together and sitting back to enjoy the result. Well, I know that I do :) I'll post another photo or two once I get the license plates installed, but other than that I am calling this one done. Buy eagle performance parts Our online Eagle accessories and parts catalogues are reliable and will help in finding whatever Eagle parts you are looking for. Eagle Accessories serve as the most important part for the car lovers. Be it indoor accessories like Eagle seat cover, music system or exterior accessories like lights and Eagle car covers. Anyone who admires the beauty of Eagle and loves it more than anything else will make sure that it looks nothing but the best. This is where we step in.